Get a free and instant report of the food and drinks you supply with our new online assessment tool, FoodChecker! * Please note: this does not apply to hospital inpatient menus or patient food services. You can assess a full menu (such as a catering menu or retail outlet menu), or individual products and recipes. When you use FoodChecker you will receive an instant report that you can read on screen or save as a PDF. It contains feedback on the foods and drinks you supply, and tailored recommendations for healthier changes to meet the Healthy Choices guidelines. "My experience has been nothing but positive with sports clubs' assessments. The reports are a game changer!" 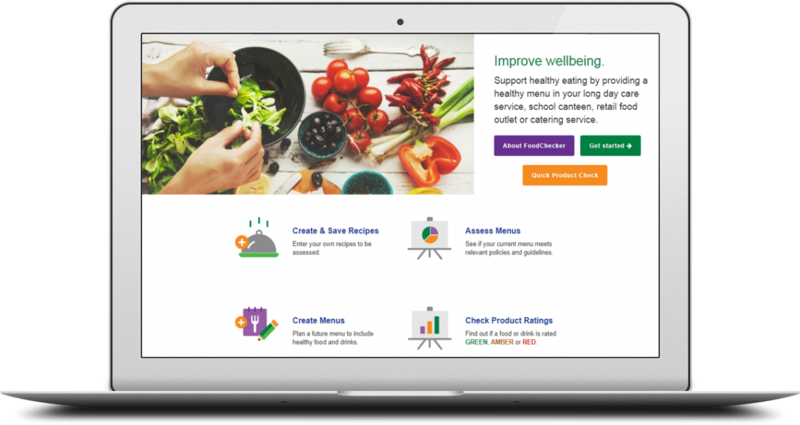 You can use FoodChecker to assess the entire menu for a retail food outlet or catering, including recipes, branded products, and stand-alone items such as ‘apples’ and ‘milk’. When you make changes to your menu you can reassess it online. You can also use FoodChecker to plan future menus that meet the Healthy Choices guidelines. Having a menu assessment is an important step towards promoting healthy eating for your staff, customers and visitors. It also helps your organisation work towards the Healthy Eating benchmarks of the Achievement Program. You can use our Counting Guide to help you understand exactly how to count items within your retail outlet for your menu assessment. You can use FoodChecker to find out if the recipes you prepare on site are rated as GREEN, AMBER or RED. Your instant report will include the recipe’s classification, plus recommendations on how to make it healthier, such as modifying ingredients or reducing serving size. You can enter your own recipe, or use the ‘common recipes’ feature to select from over hundreds of standard recipes, and modify it to match yours. You can also save recipes to use in future. You can use FoodChecker to find out if the branded food and drink products you supply are classified GREEN, AMBER or RED. Want to assess products in a vending machine? Click here to use our online Healthy Vending Assessment tool.